BRANT’S RETURN, A Sign of Love, Capricorn, IS LIVE on Audible! I’m a huge fan of Mia Sheridan’s writing; she infuses so much heart into her stories that it’s impossible not to get wrapped up in the lives of her characters and the issues that they would rather run from than face, even though there will come a point in the story when dealing with the past will be the only way for them to build a new life in the present. 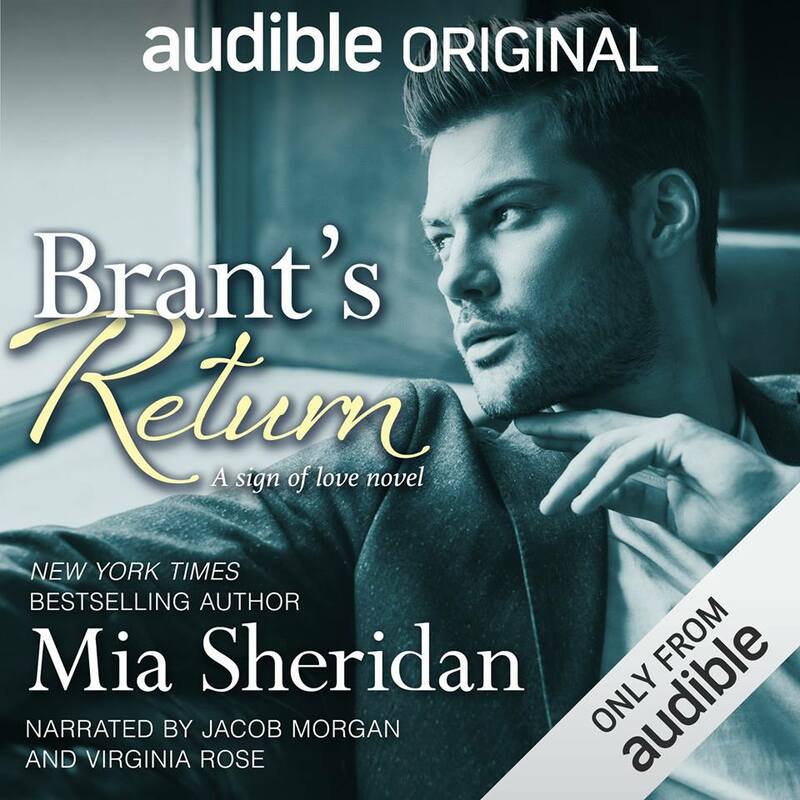 In the Audible Original, Brant’s Return, Sheridan takes readers on an overwhelmingly heartfelt, emotional, and suspenseful journey – one that begins with a devastating and life altering moment for the heroine and then continues to tell her story and the path she follows that helps to heal her and also allows her to bring a dying man’s son home after over a decade’s absence. Isabelle Farris is a unique heroine, not only because of what she’s endured but also because she doesn’t allow her pain and heartbreak to completely define her life, even if, at times, it’s incredibly difficult to not succumb to the memories of her past. For the past few years, Belle has found comfort and peace at Graystone Hill through its equine program and even with its cantankerous owner. She’s a loving, caring, and compassionate woman who breathes new life into her place of employment, even if Mr. Talbot is an ornery old cuss, and because Isabelle wants her boss to have a chance to say goodbye, something she wasn’t able to do, she works to bring Mr. Talbot’s son home to Kentucky even if she doesn’t understand the reasons for his absence. Brant Talbot may have once been a good ole country boy, but for the past decade or so, he’s been known as the Bourbon King of New York, building his own empire one bar at a time, but one phone call brings his past into the present, and he’s forced to decide if heading back to Kentucky is worth the pain that will come with it since he’s never truly dealt with what sent him running from the place he used to call home. The hero and heroine both are fighting demons from their pasts, but while Isabelle is working through what/who she’s lost, focusing on taking each day as it comes, Brant can’t let go of his last memories of Graystone Hill and Mia Sheridan brilliantly illustrates that fact with his arrogant and assholish behavior. But as Brant’s time on the ranch continues and he gets out of his own way, Brant soon sees Isabelle how everyone else at Graystone Hill does, and he starts to realize that his posh life in New York isn’t as fulfilling as he once thought, but what that means for Brant, his father, and his developing feelings for Isabelle remains unclear because there are too many variables to deal with and work through not to mention the fact that Brant and Isabelle live in two completely different worlds. Brant’s Return’s blurb doesn’t indicate the depth of this story, so I wasn’t quite prepared for the emotional torment that occurred from its first few pages. Listeners can’t help but feel EVERYTHING that Isabelle fights through because her perspective is so emotionally charged and it’s remarkable to hear how she lived her life even when she wanted to succumb to the pain. Belle is a fighter and that shines through in her interactions and attitude towards Brant, his father, and the community she was forced to leave behind. Jacob Morgan and Virginia Rose do a great job narrating Isabelle and Brant’s story, and while, in my opinion, this is much more Isabelle’s story than Brant’s due to her backstory and what she still must work through, through Brant’s eyes, listeners hear Brant’s truths and understand his past actions as well as why he struggles to come to terms with everything he feels for Isabelle and learns about the night that irrevocably changed the direction of his life.